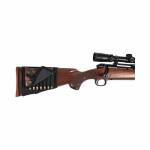 Made from durable, heavy weight elastic that fits snugly to the stock of your firearm without interfering with holding or aiming the gun. Color: Black Holds 8 Cartridges Mossy Oak Break Up Country ..
* Opens quietly * Side release closure * Attaches to any belt * 10 Shotgun shells .. Holds 15 (20 or 30 round) 223/5.56 AR15 magazines. 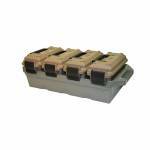 The slots were designed for the Magpul PMAG 30 AR/M4 magazines without dust covers. Dust covers are not needed in an O-ring sealed can. Will hold only 6 Magpul PMAG 30 AR/M4 with Ranger Plates & dust covers on. They don’t fit under the handle indentation on the lid when closed. Not designed for 308 AR’s. 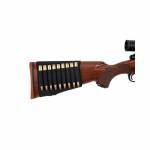 Designed to hold 20 or 30 round 223/5.56 AR15 magazines in precut foam padding Stackable design and triple padlock tabb.. 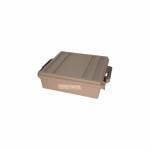 This O-Ring sealed ammo can is molded out of rugged polypropylene plastic with a reinforced bottom. They are tough durable and water resistant. It is also as versatile as it is sturdy. 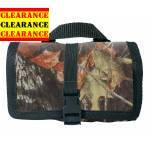 It can be used for bulk ammo boxed ammo decoy weights or even food for your canine hunting companion. It offers a heavy-duty latch double padlock tabs and molded in stacking ridges for slip resistant stacking. Holds up to 25 pounds and can be used for storage in damp basements. Inside Dimensions: 7.5"(L) x 13"(W) .. 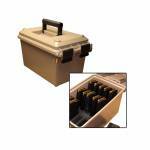 Initially designed for ammo storage, but also stores hunting or survival gear. Two extra strong handles make it easy to carry upto 85 pounds of gear. Designed to be stacked high, using molded-in stacking ridges. Four hook points for ATV attachment. Utilizing MTM's tongue and groove O-Ring seal system for a superior water-resistant dry storage. 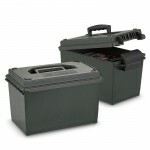 Double padlock tabs along with two strong latches make these ammo crates the perfect solution for many storage needs. 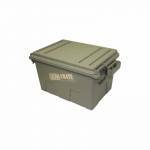 Made in the USA, with high-impact po..
MTM Ammo Crate Utility Box ACR7 - OD Green. 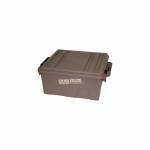 Initially designed for ammo storage, but also stores hunting or survival gear. Two extra strong handles make it easy to carry upto 65 pounds of gear. Designed to be stacked high, using molded-in stacking ridges. Four hook points for ATV attachment. Utilizing MTM's tongue and groove O-Ring seal system for a superior water-resistant dry storage. 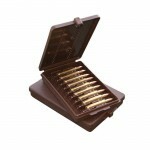 Double padlock tabs along with two strong latches make these ammo crates the perfect solution for many storage..
Hunters as well as police snipers will appreciate being able to remove bullets quickly and quietly from their jacket or shirt pocket using these 9 round ammo wallets. 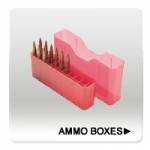 These boxes hold your ammo securely and also provide tip protection. They come with a textured finish and a MTM 10-year guarantee. ..
Made from durable, heavy weight elastic that fits snugly to the stock of your firearm without interfering with holding or aiming the gun. Color: Black Holds 9 Cartridges ..